Rear seat entertainment systems are a great way to keep family and friends entertained while driving. Whether you are looking for a system to keep your kids happy on those long trips or something for you and your friends to pass the time while on the way to your next adventure, the Audio Garage has you covered. Overhead video systems are where it all started and are still popular to this day. They come in multiple screen sizes and in finishes designed to complement the colors of modern interiors. Our team are experts at properly mounting overhead systems – an area where many shops will cut corners. All of our systems are securely mounted to metal braces in your roof to ensure long-lasting, stable performance. People choose these systems for their overall value, large screen size and central mounting in the roof of the vehicle, which allows for easy viewing by all backseat passengers. 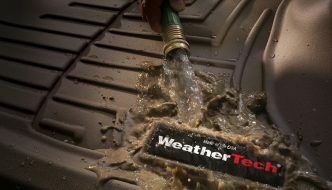 Many people come to us thinking they can’t have an overhead screen because their vehicle’s roof isn’t flat. Fortunately, the Audio Garage has an in-house fabrication department that can make a custom mount for your screen to make it look factory-installed. Headrest video systems get more popular every year, and they come in two different styles: replacement headrests and active seatback systems. Replacement headrest systems are complete replacement headrests with integrated monitors and DVD players already installed. We use vendors that will match the material to the stock headrest, making them look factory-equipped. These systems come in different screen sizes and can be equipped with a single or dual DVD drive. Active seatback systems are a more recent introduction that came along with the advent of active headrest safety systems. In simple terms, should you be involved in a collision, the headrest will actually move to help reduce the possibility of injury to your head and neck. 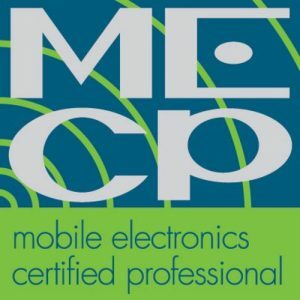 If your vehicle is equipped with this technology, we install a replacement monitor directly behind your headrest, keeping the safety system intact. 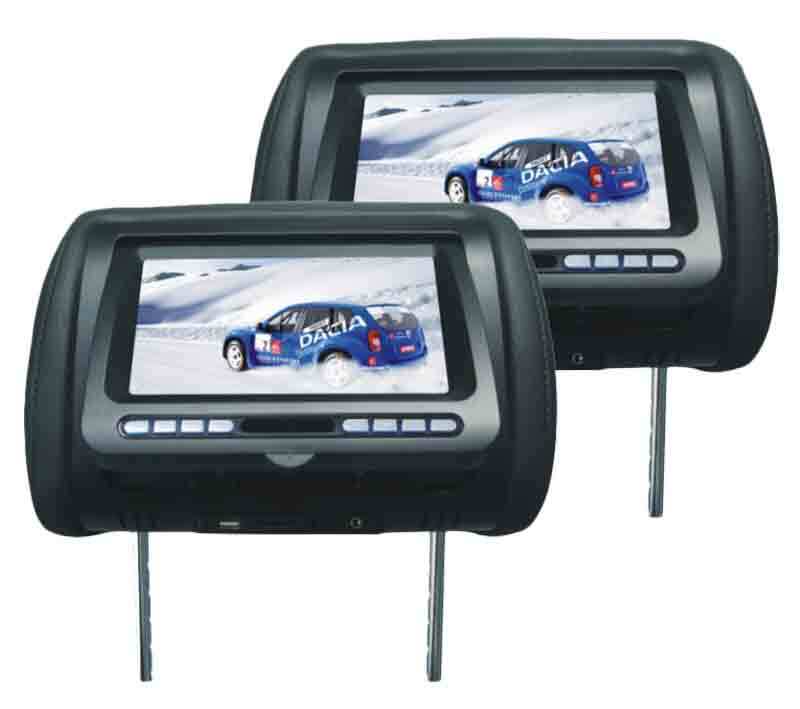 Just like the replacement headrest systems, multiple screen sizes are available, along with single and dual DVD drives. Popular options for all of these systems include HDMI inputs so you can link the video output of your smartphone, tablet or other streaming device directly, along with a video game system. Some new products even allow wireless streaming of video content. The Audio Garage can often install an interface to allow you to stream your content seamlessly to the entertainment system. The most popular way to listen to the soundtrack is by using wireless headphones. These allow the driver and front seat passenger to enjoy the music of their liking while the rear seat passengers are entertained by their videos. 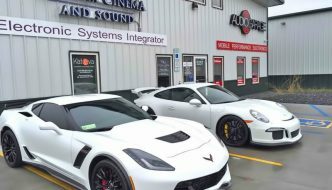 If you would like the ability to hear the soundtrack of your videos through the car audio system, our team can do that for you as well. For the ultimate road trip experience, many people will change out their factory-installed stereo system with an in-dash DVD touchscreen system that can be integrated with all of the screens in the vehicle. 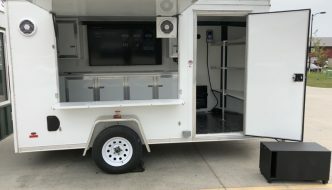 Imagine arriving early for an event and, instead of sitting there bored while waiting for it to start, all of the occupants can now enjoy the video while the vehicle is parked. If you want the full movie experience, our team can upgrade the audio system to give your movie the same impact you would experience at your favorite theater. 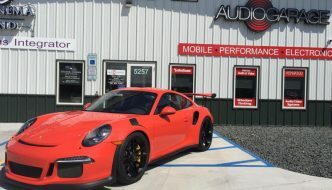 We invite you to stop by the Audio Garage with your vehicle. One of our specialists will work one on one with you to design and build the rear seat entertainment system that best meets your needs. You can also contact us HERE for more information.